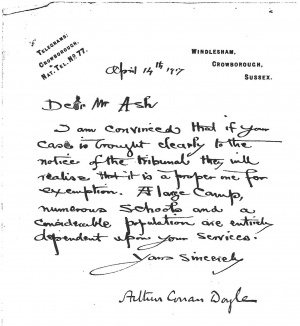 This letter was dictated (but signed) by Arthur Conan Doyle on 14 april 1917 from Windlesham to Richard Guy Ash, a dentist from Crowborough. I am convinced that if your case is brought clearly to the notice of the tribunal they will realise that it is a proper one for exemption. A large camps, numerous schools and a considerable population are entirely dependent upon your services. This page was last edited on 7 February 2018, at 23:48.